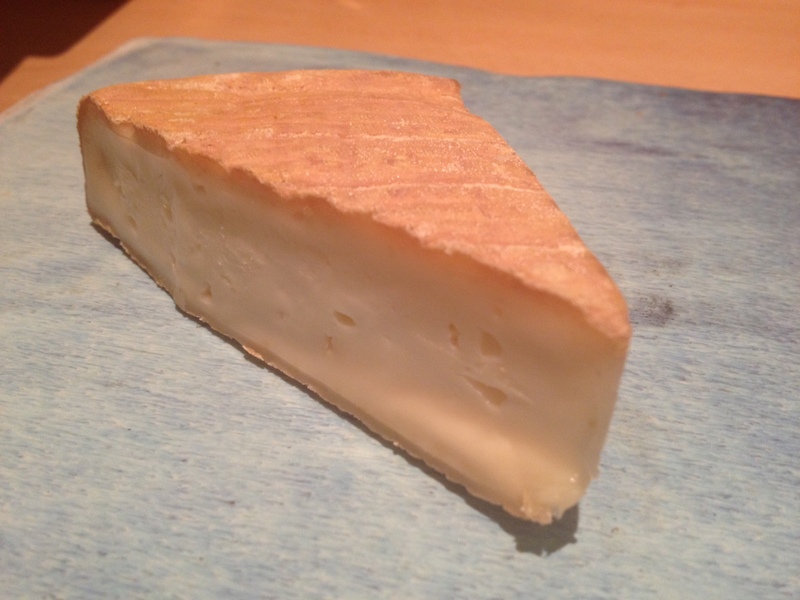 St James is an unpasteurised, rind-washed, sheep’s milk cheese produced by Martin Gott, his partner Nicola Robinson and Andrew and Sandy Legg of Holker Farm Dairy in Cumbria. Martin has been immersed in farming and cheese-making since he was a teenager, when his father bought a flock of ewes and legendary cheesemaker, affineur and champion of farmhouse cheese James Aldridge came to work with them. Martin went on to work with Graham Kirkham, of the eponymous and much-feted Lancashire cheese, Mary Holbrook, who is renowned for her seasonal goat’s cheeses such as Sleightlett and Randolph Hodgson, the founder of Neal’s Yard Dairy. As tutors go, not a bad lot to learn your trade with. A bit like being an actor and making your first film with Robert De Niro, Al Pacino and Vanessa Redgrave. In 2006, Martin and Nicola moved to the Holker Estate and began to build a flock and dairy, only for disaster to strike when their sheep contracted an incurable virus and sadly had to be destroyed. Determined not to give up, Martin went to the Auvergne in France and sourced some Lacaune sheep, the breed responsible for Roquefort cheese and famous for producing delicious milk. Gott farms seasonally, resting the sheep over the winter months and they are milked just once a day to minimise stress and the risk of disease. They have 20 acres of clover-rich pasture to gobble on and altogether lead what sounds like a rather nice life. You can see the farm and dairy in this quietly enigmatic film, which also features Mary Holbrook and Cheddar-king Jamie Montgomery. St James is named after the aforementioned James Aldridge. Despite passing away nearly fifteen years ago, Aldridge’s name and influence lingers on in British cheese-making. The Specialist Cheese-Makers Association named an award after him which celebrates the best in unpasteurised cheese each year and many cheeses that he helped to develop are still popular today, such as Lord of the Hundreds, Tornegus and Celtic Promise. In particular, Aldridge was a pioneer of washed rind cheeses, which it’s fair to say were not a huge feature on the supermarket shelves of the 1980s. St James continues his legacy, as it’s a brine-washed cheese. It’s made from raw milk, pumped straight from the milking parlour to the dairy in the morning. Starter culture is added and the milk allowed to ripen before rennet is added. When the curd has set, it’s cut into half inch squares, drained and scooped into moulds lined with cloth – which helps to draw out moisture so that a rind can develop. The cheeses are then left to drain, with some pressure applied. After they are removed from the moulds, they spend a day in a warm and humid room before being dry-salted (which means the salt is applied to the exterior of the cheese, as opposed to some cheeses where the salt is mixed through the curds). Finally, on day five, the cheeses make the journey to the maturing rooms where they are regularly washed in brine; this encourages the old Brevibacterium linens cultures, which give washed rind cheeses their distinctive orange rind and ‘smelly toes’ smell (the B. Linens culture is actually also responsible for making your feet ponk). Washed rind sheep’s cheeses are pretty rare and I have to admit I was nervous of this cheese and what would become of the sheepiness when it was rind-washed. I quite like a washed rind but I had yet to find one that my usually cheese-loving Other Half would tolerate. I worried that this one might send him over the edge. It looked lovely, a peachy-caramel colour and so I gave it a sniff. Rather than a whiff of gym socks, it smelled of smoky bacon (washed rinds were developed by monks who apparently appreciated their ‘meaty’ flavour as a supplement to their vegetarian diet). And unlike many washed rinds who make a run for it as soon as you cut through the rind, its paste remained firm, but not in a chalky way. It tasted rich and creamy but the savoury tang of bacon remained. The Other Half nodded, converted. It seems like St James is indeed a rare cheese. Additional research from Neal’s Yard Dairy, Culture cheese magazine and Northern Farmer. Mmm you’ve made me crave a second breakfast of washed rind sheep’s milk cheese. Good work! I’m with your O-H on washed rind cheeses. I’d best seek this one out soon and give it a whirl, thanks. Definitely one to try. It wasn’t one of those washed rinds that takes over your fridge and means that you have to wash your hands seven times to get rid of the stench! Much more subtle but still rich. That one is definitely going on the cheese board soon. I know Martin Gott has (or had when we lived there) a stall at Borough Market but I haven’t seen this one on sale locally. Another one to look out for. Not sure if they still have a stall but you can get it round the corner in nyd. What a great find and spectacular description. Looks like a yummy slice of cheesecake! So glad your Other Half enjoyed it as well. The Hubby still turns up his nose when I bring in the funky stuff. Stay Cheesy!